Cheers to Entangled Teen for publishing a story from one of my top favorite authors, Shannon Greenland! I jumped at the chance to read Shadow of a Girl because past experience reading The Specialists series and The Summer my Life Began demanded that I not miss out on this opportunity. Shadow of a Girl is exactly the teen drama I expected it to be, but the nature of this story takes readers to a different level. Shannon Greenland creates strong female leads who appear innocent, or naive, yet take the story by storm with fierce determination. Eve is no exception as she fights against the currents of a miserable life to emerge happy and whole. She runs from a violent upbringing and lives the life of a hardworking roadie, keeping her head down while staying under the radar. Starting a romance with West Wolff, lead singer of Bus Stop, is just the kind of distraction she needs but doesn't want to risk. The risk becomes even more real as Eve's past catches up to her and threatens the new life she built for herself. I appreciate the fast moving pace of the story. It jumps off immediately and the nature of Eve's plight is a constant reminder as she moves from city to city. There aren't any unnecessary lulls in the story and all attention is focused on Eve and West. Their relationship is partially a driving force because within it we see Eve grow and use the happiness she feels to overcome the fears that are keeping her down. While the story was sweet at the right moments it still seemed to not balance enough. While past Shannon Greenland novels have been more on the light hearted side, I did expect this one to be similar with a little edge. The premise of the story, and the moments Eve becomes paralyzed by fear, led me to believe the novel would delve a little deeper into her upbringing and focus on the chilling thrill of escaping or enduring of that life. Some of those scenes felt glossed over while our attention was brought back to the romance. In other words, a simple solution to a big problem. Sadly, the story just didn't grip me past the romance and that would've made this even more of a stand out. Not every story can be perfect, but then again, when we're reading for a quick escape we don't always expect perfection. 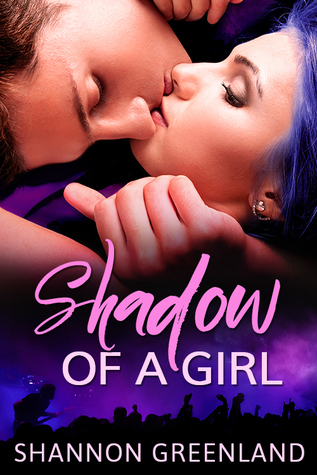 I still definitely enjoyed Shadow of a Girl, and encourage Shannon Greenland fans to pick it up and not miss out on her latest gem! Check out my interview with Shannon from 2013!